A rich natural herbal treat for dull, grey and lifeless hair prevents greying hair giving back natural color. Contains heena leaves along with amla, bringraj, bramhi and mandoor bhasma. This combination has been traditionally used to give shine and healthy body to hairs in addition to giving it a rich brown color. Sunab is a unique 100% natural hair color, first of its own kind in world, made out of rare ayurvedic herbs, which not only colors your hair almost permanently but improves health of hair naturally. 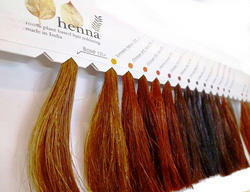 - A ready to use pure heena hair pack specially formulated with essential herbs to overcome the hair & scalp problems. - Adds lustre, shine & colour to hair. - Makes hair manageable. Excellent for lifeless hair. - Does not contain any dyes or chemicals. Dump henna powder in a bowl and mix with water or tea dictation. Make it as a paste and leave it for the whole night. - Put on your gloves and start applying the henna. Start at the top and take a very small partition of your hair.